King june and Akwamu leadership of 1733 Rebellion… Akwamu chief, King June, a field slave and foreman on the Sødtmann estate, led the rebellion. Other leaders were Kanta, King Bolombo, Prince Akashi , and Breffu. According to a report by French planter Pierre Pannet, the rebel leaders met regularly at night for some time to develop the plan. A group of rebels under the leadership of King June stayed at the fort to maintain control; another group took control of the estates in the Coral Bay area after hearing the signal shots from the fort’s cannon. The slaves killed many of the whites on these plantations. The rebel slaves moved along to the north shore of the island. In each area, they avoided widespread destruction of property since they intended to take over the estates and resume crop production for their own benefit. The 1733 slave insurrection on St. John in the Danish West Indies, (now St. John, United States Virgin Islands) started on November 23, 1733 when African slaves from Akwamu revolted against the owners and managers of the island’s plantations. 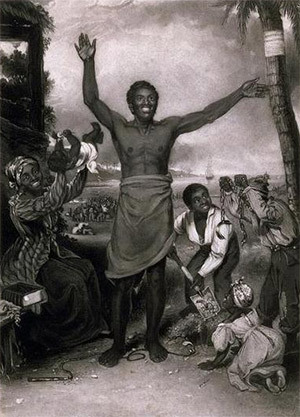 The slave rebellion was one of the earliest and longest slave revolts in the Americas. The slaves captured the fort in Coral Bay and took control of most of the island. The revolt ended in mid-1734 when troops sent from Martinique defeated the Akwamu. When the Spanish first occupied the West Indies, they used the indigenous people as slave labor but disease, overworking, and war wiped out this source of labor. When the Danes claimed Saint John in 1718, there was no available source of labor on the island to work the plantations. Young Danish people could not be persuaded to emigrate to the West Indies in great enough number to provide a reliable source of labor. Attempts to use indentured servants from Danish prisons as plantation workers were not successful. Failure to procure plantation labor from other sources made importing slaves from Africa the main supply of labor on the Danish West Indies islands. Slave export on ships flying under the Danish flag totaled about 85,000 from 1660 to 1806. The Danes embarked in the African slave trade in 1657, and by the beginning of the eighteenth century, the Danish West India and Guinea Company had consolidated their slave operation to the vicinity of Accra on the Guinea coast. 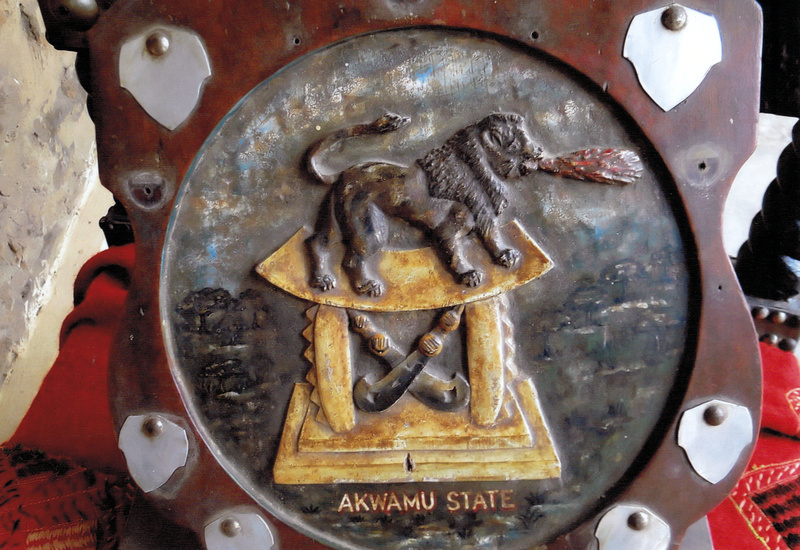 The Akwamu were a dominant tribe in the district of Accra and were known for being “heavy-handed in dealing with the tribes they had conquered.” After the Akwamu king died, rival tribes in the area attacked the weakened Akwamu nation, and by 1730 the Akwamu were defeated. In retaliation for years of oppression, many Akwamu people were sold into slavery to the Danes and brought to plantations in the West Indies, including estates on St. John. At the time of the 1733 slave rebellion on St. John, hundreds of Akwamu people were among the slave population on St. John. 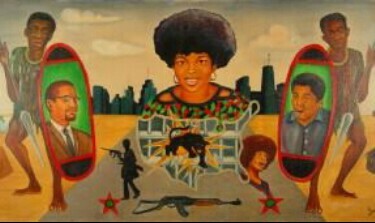 Approximately 150 Africans were involved in the insurrection, and all of them were Akwamus. West Indies harborIn 1718 the Danish made claim of the island of St. John for the purpose of establishing plantations. One hundred nine plantations with more than 1,000 slaves existed on St. John by the time of the 1733 slave rebellion. Many of St. John’s plantations were owned by people from St. Thomas who had estates on that island and did not make their residence on St. John. Instead the absentee landowners hired overseers to manage their land on St. John. The population of African slaves on St. John greatly outnumbered the Europeans inhabitants with 1087 slaves and 206 whites. The Danish West India Company did not provide a strong army for the defense of St. John. Besides the local militia, the number of soldiers stationed on St. John at the time of the slave revolt numbered at six. MarooningIn 1733, in response to harsh living conditions from drought, a severe hurricane, and crop failure from insect infestation; slaves in the West Indies, including on St. John, left their plantations to maroon. In October, 1733, slaves from the Suhm estate on the eastern part of St. John, from the Company estate, and other plantations around the Coral Bay area went maroon. The Slave Code of 1733 was written to force slaves to be completely obedient to their owners. Penalties for disobedience were severe public punishment including whipping, amputation, or death by hanging. A large section of the code intended to prevent actual marooning and stop slaves from conspiring to set up independent communities. Slave revoltThe Akwamus on St. John did not see themselves as slaves, since in their homeland many were nobles, wealthy merchants or other powerful members of their society; so marooning was a natural response to their intolerable living conditions. 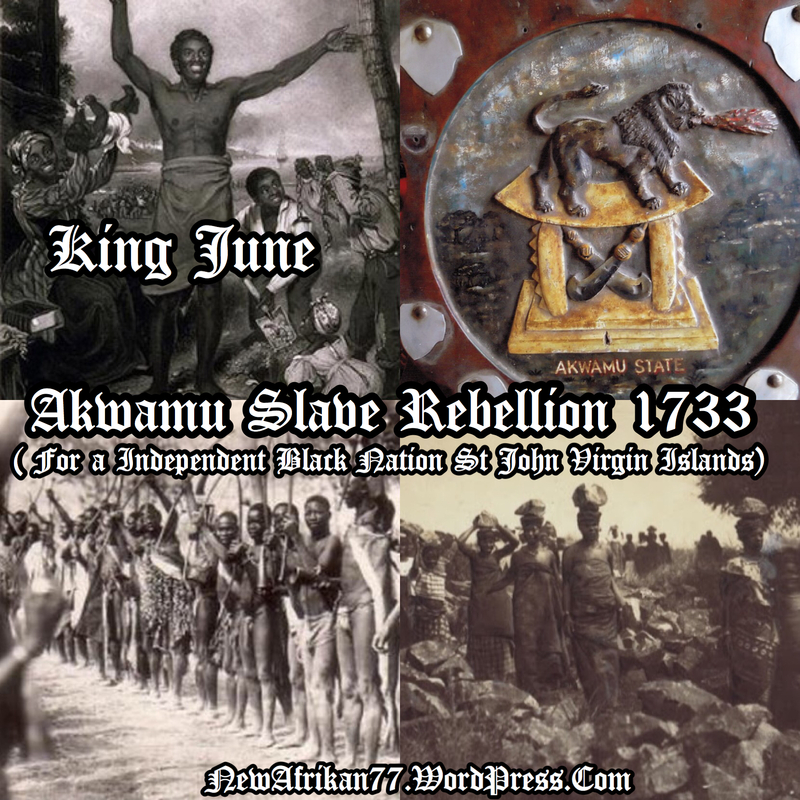 The stated purpose of the 1733 slave insurrection was to make St. John an Akwamu-ruled nation. These new land owners planned to continue the production of sugar and other crops. The leader of the revolt was an Akwamu chief, King June, a field slave and foreman on the Sødtmann estate. Other leaders were Kanta, King Bolombo, Prince Aquashie, and Breffu. According to a report by a French planter, Pierre Pannet, the rebel leaders met regularly at night to develop the plan. Events on November 23, 1733The 1733 slave insurrection started open acts of rebellion on November 23, 1733 at the Coral Bay plantation owned by Magistrate Johannes Sødtmann. An hour later, slaves were admitted into the fort at Coral Bay to deliver wood. They had hidden knives in the lots, which they used to kill most of the soldiers at the fort. One soldier, John Gabriel, escaped to St. Thomas and alerted the Danish officials. A group of rebels under the leadership of King June stayed at the fort to maintain control, another group took control of the estates in the Coral Bay area after hearing the signal shots from the fort’s cannon. The slaves killed many of the whites on these plantations. The rebel slaves then moved to the north shore of the island. They avoided widespread destruction of property since they intended to take possession of the estates and resume crop production. Accounts of the rebel attacksAfter gaining control of the Suhm, Sødtmann, and Company estates, the rebels began to spread out over the rest of the island. The Akwamus attacked the Cinnamon Bay Plantation located on the central north shore. Landowners John and Lieven Jansen and a group of loyal slaves resisted the attack and held off the advancing rebels with gunfire. The Jansens were able to retreat to their waiting boat and escape to Durloe’s Plantation. The loyal Jansen slaves were also able to escape. The rebels looted the Jansen plantation and then moved on to confront the whites held up at Durloe’s plantations. The attack on Durloe’s plantation was repelled, and many of the planters and their families escaped to St. Thomas. End of the rebellion and the aftermathTwo French ships arrived at St. John on April 23, 1734 with several hundred French and Swiss troops to try to take control from the rebels. With their firepower and troops, by mid-May they had restored planters’ rule of the island. The French ships returned to Martinique on June 1, leaving the local militia to track down the remaining rebels. The slave insurrection ended on August 25, 1734 when Sergeant Øttingen captured the remaining maroon rebels. The loss of life and property from the insurrection caused many St. John landowners to move to St. Croix, a nearby island sold to the Danish by the French in 1733. Franz Claasen, a loyal slave of the van Stell family, was deeded the Mary Point Estate for alerting the family to the rebellion and assisting in their escape to St. Thomas. Franz Claasen’s land deed was recorded August 20, 1738 by Jacob van Stell, making Claasen the first ‘Free Colored’ landowner on St. John. Freedom 100 years laterThe slave trade ended in the Danish West Indies on January 1, 1803, but slavery continued on the islands. When the slaves in the British West Indies were freed in 1838, slaves on St. John began escaping to nearby Tortola and other British islands. On May 24, 1840, eleven slaves from St. John stole a boat and escaped to Tortola during the night. The eight men (Charles Bryan, James Jacob, Adam [alias Cato], Big David, Henry Law, Paulus, John Curay), and three women (Kitty, Polly, and Katurah) were from the Annaberg plantation (one) and Leinster Bay (10) estates. Brother Schmitz, the local Moravian missionary, was sent to Tortola by the St. John police to persuade the slaves to return. After meeting with the Tortola officials and the runaway slaves, Schmitz returned to St. John to relay the slaves’ resolve to stay away because of abusive treatment by the overseers on the plantations. After the overseers were replaced, Charles Bryan, his wife Katurah, and James Jacobs returned to work at Leinster Bay. Kitty, Paulus, David, and Adam moved to St. Thomas. Henry Law, Petrus, and Polly remained on Tortola. John Curry relocated to Trinidad. None of runaway slaves were punished. On July 3, 1848, 114 years after the slave insurrection, enslaved Africans of St. Croix had a non-violent, mass demonstration that forced the Governor-General to declare emancipation throughout the Danish West Indies.